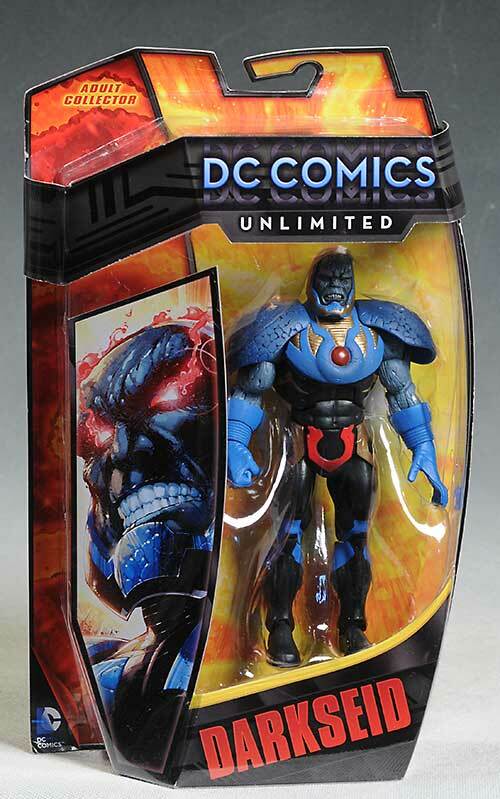 If you're a big fan of the New 52 character designs AND the DC Universe Classics style of action figure, then you're probably in heaven with the DC Unlimited figures currently being produced. I'm not a fan of most of the New 52 designs, so the DCU stuff has been a bit hit or miss for me. The fact that I love the DCUC style of action figure keeps me coming back for more, even when the designs are lacking. The latest two to cross my path are Aquaman and Darkseid. I picked them up online through Amazon where they were $16 each, but you can also find them at many mass market stores. Same old stuff here, but it's decent enough looking on the pegs. The weird shape and large bubble can make it tough for the MOCers to display them or store them, and I hate all the wasted space, but the personalized text on the back goes a long way to make up for some of the issues. 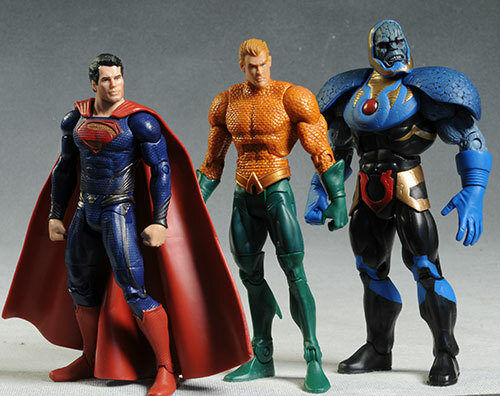 While Aquaman is the usual 6 1/2" or so, Darkseid has that extra bulk and height that takes him up to almost 7". Because they are using the same style body as the previous DC Universe Classics line, they fit in well with them on display. As I mentioned, the new designs and suits are a all over the map for me. 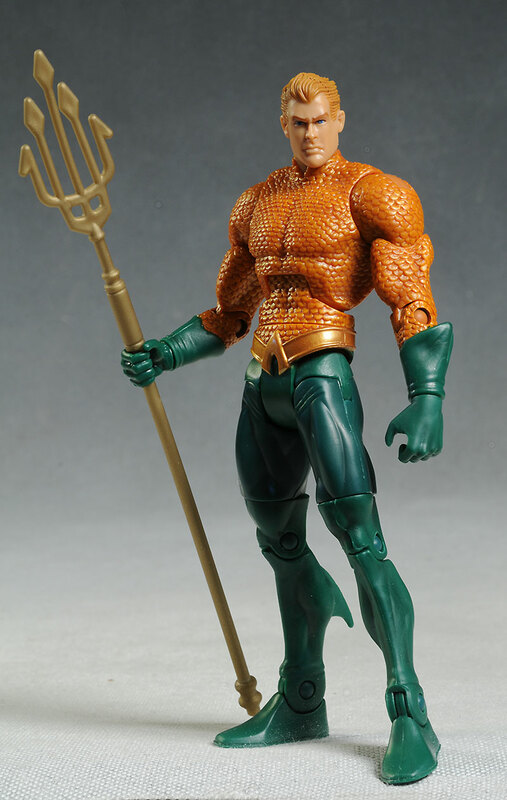 While the Aquaman design is a bit too retro-fusion for my general tastes, it's a reasonable look I suppose. 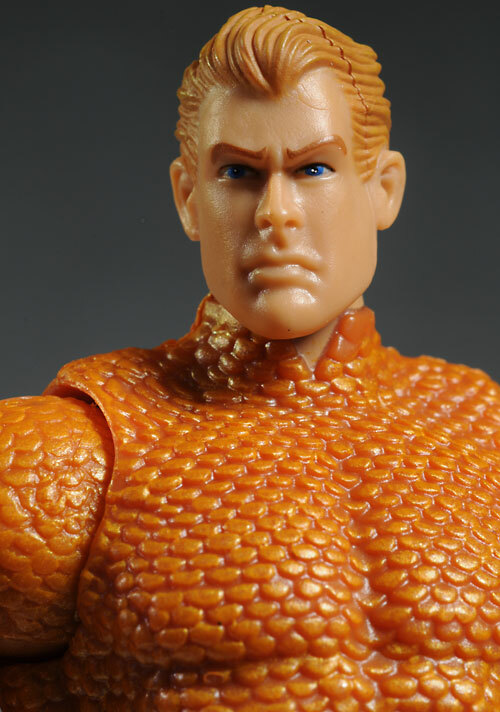 The detail on the fish scale shirt is great, and the basic head sculpt looks good. There is a very noticeable mold line through the hair though, which is not something I expect with an action figure directed specifically at the 'adult collector'. His head is slightly - very slightly - undersized as well, but it's a minor nit. 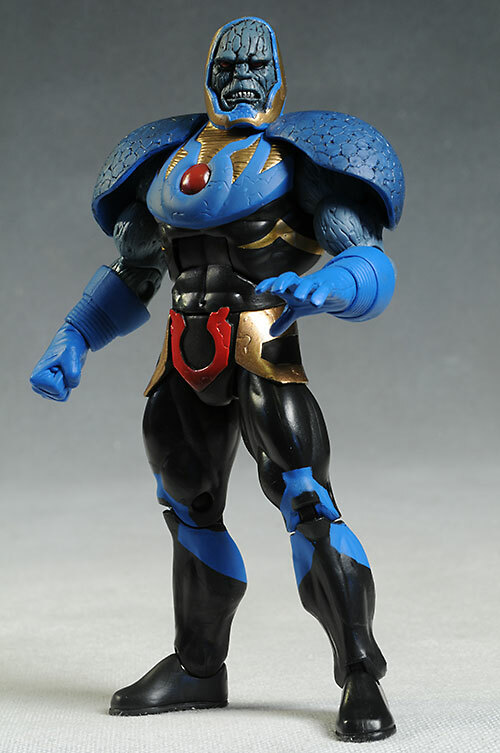 Darkseid's new design, like Hawkman's, is actually one I like very much...with one big exception. The armor detail is great, and I love the way they've handled the stone-like texture of his skin. The slightly lopsided head has a dangerous expression - that is one serious under bite! - and the articulation isn't restricted by any aspect of the sculpt itself. These are all very good points, and if it were not for my one nit, he would have pulled four stars in this category. But those shoulder pads - what the Hell is up with that armor? Their monstrous size looks goofy when translated into the three dimensional world, and make his lower body seemed undersized and skinny. Shrink those bad boys down to something that doesn't look like a pathetic attempt at physical compensation, and he would have done much better here. It's worth mentioning the hand sculpts on both of these. 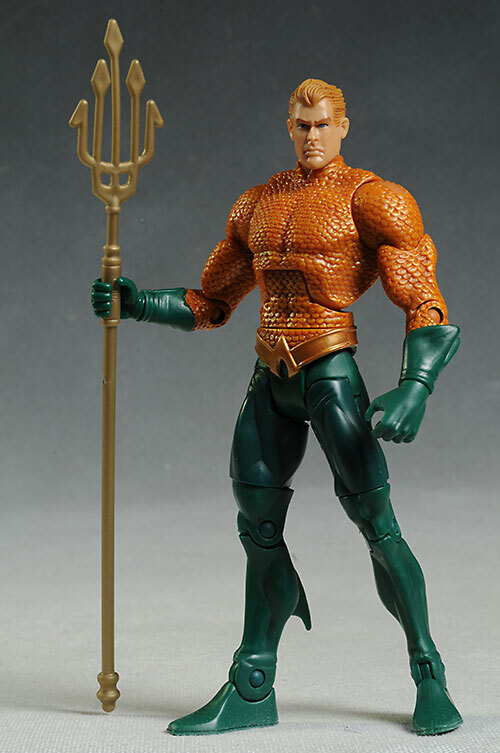 Aquaman has gripping fists to hold the trident, and the fingers are soft enough to allow you to place it inside the grip without too much trouble. 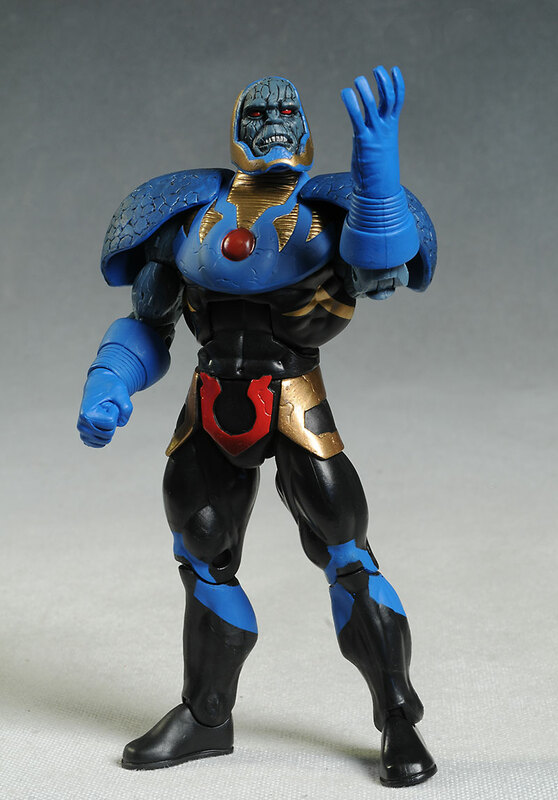 Darkseid has a classic look with a right handed fist, and a left handed gesture pose. Like my feelings toward the designs, the paint work has been hit or miss on this series so far. Here it's mostly hit, with lots of clean lines, sharp edges, and very little bleed or slop. There's still a little here or there, with minor issues on both figures. But considering the scale, they really are minor. Aquaman doesn't sport quite as many ops as Darkseid, but what's there is fairly clean. Those familiar with the old DC Universe Classics will feel right at home with the articulation on these figures. They both have ball jointed necks of course, and both work well. 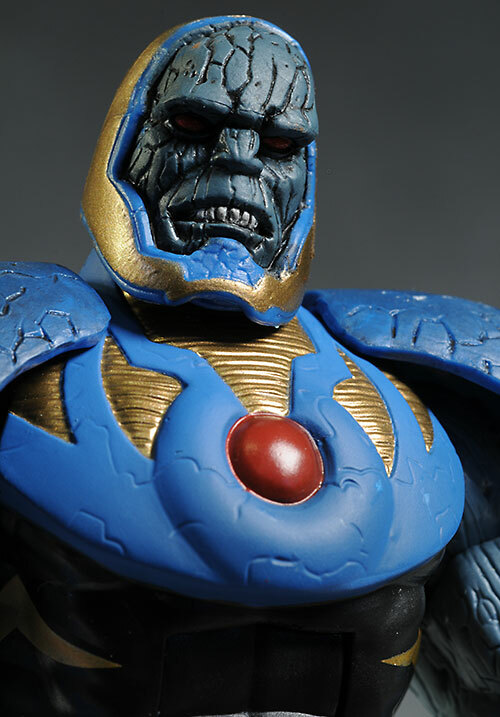 It's actually Darkseid that does a little better here, even with the bulky armor and bad skin. They also have ball shoulders, cut biceps, pin elbows, cut wrists, and ab-crunch, a cut waist, hinge hips, cut thighs, and pin elbows and ankles. All these joints have a nice range of movement, and they are engineered in such a way that even the simplest pose has a natural flow. Aquaman takes a ding because of some loose ankles, which make certain poses a bit tricky. They also mean he's less likely to remain standing over time, and it was a bit frustrating working with him. Hopefully this is a one off sort of thing, and the one you buy won't exhibit the same issue. Sadly, Darkseid gets a big goose egg here. While they've kept the price pretty consistent, they've stripped many of the figures of any extras. 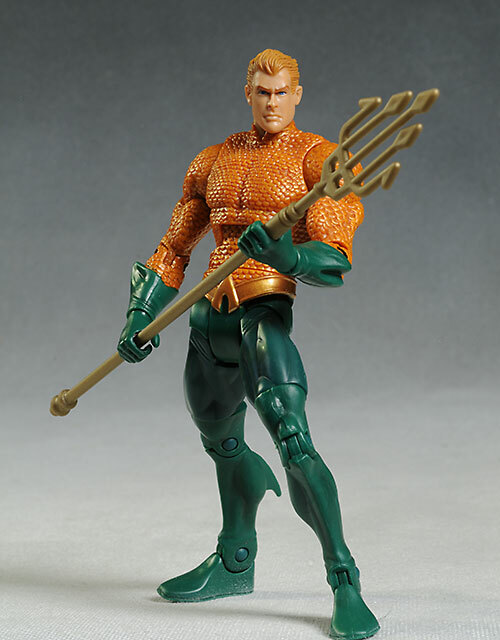 Thankfully, Aquaman does better, getting a solid colored trident. It's a decent looking staff, and fits nicely in one or both hands. Mattel knows how to make really great action figures in this size. Too bad they don't make them for kids. While these designs might be foreign to most 10 year olds, they still may find them very appealing because of the quality, articulation, and pure conflict play potential. Most action figures in this 6 - 7" scale have settled into this same $15 or so price range. The accessories have fallen off the radar, but it's still a pretty average value in the current market. 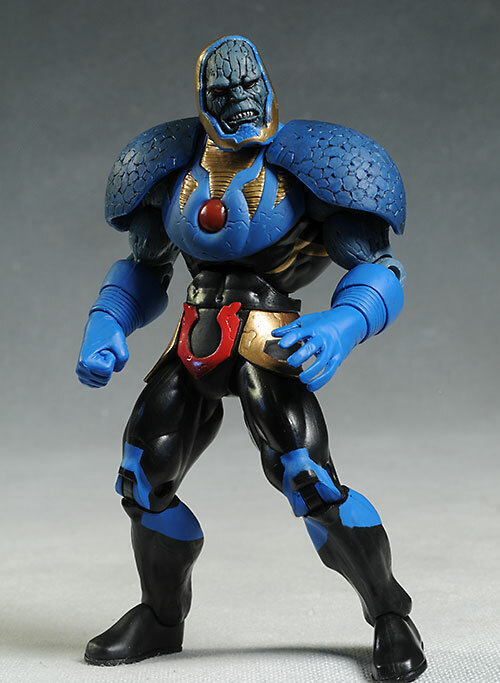 Both of these are extremely nice, but it's really the Darkseid that stands out. 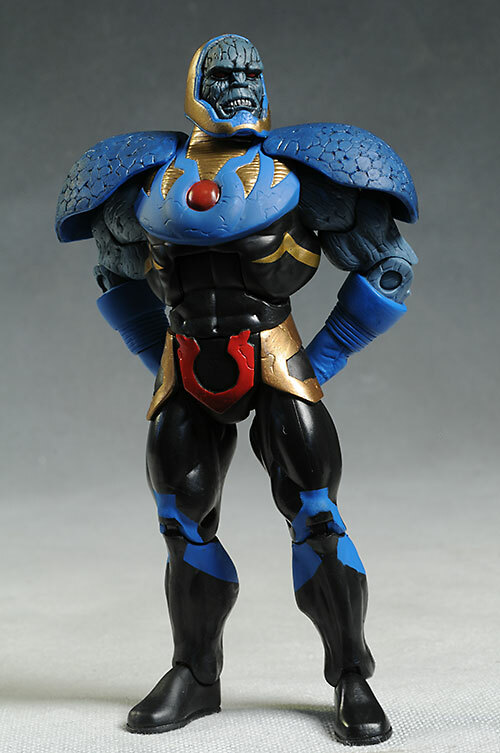 It would be tough for them to get four stars out of me with this Aquaman - the character design ends up getting in my way - but had they managed to get slightly more reasonable shoulder pads on Darkseid, he would have garnered all my love. And for those that have been paying attention to all my DC Unlimited reviews, no, I still don't have the Flash. Keep on eye on your local mass market stores, like Toys R Us or Target, for these to show up. They'll set you back $15 - $16 each. Other DC Unlimited reviews include Wonder Woman, Batman and Superman, as well as Hawkman, Dark Knight Batman and Planet X Batman, and New 52 Batman, Batgirl and Penguin.